I wish I knew the origin of 팥빙수, patbingsoo. For something I love so much, I know very little about it. It’s clearly an invention of modern refrigeration, since it requires shaved ice, the “bingsoo.” The idea also clearly spread throughout Asia, as you’ll find some variation of shaved ice with sweet beans, or “pat” (pronounced “paht”), in the Philippines, Malaysia, Taiwan, and Japan. I’d love to know where it started, who was the first to come up with that brilliant idea. In other ways, though, the dish is very self-evident. You can look at it and know what goes into it. 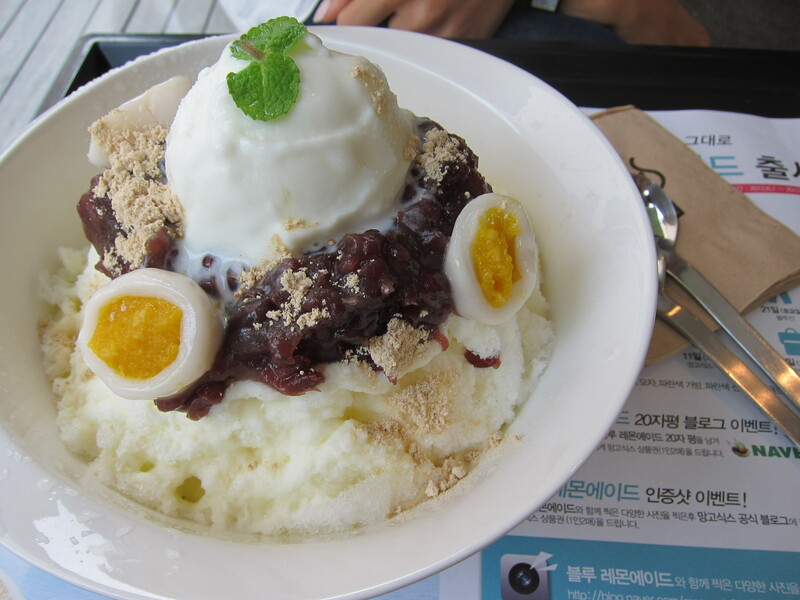 In Korea, at least, the original classic was shaved ice topped with a sauce of cooked and sweetened azuki beans, the same beans you find in sweet bean desserts all over Asia. It was a street food, and I like to imagine men pushing giant blocks of ice around. 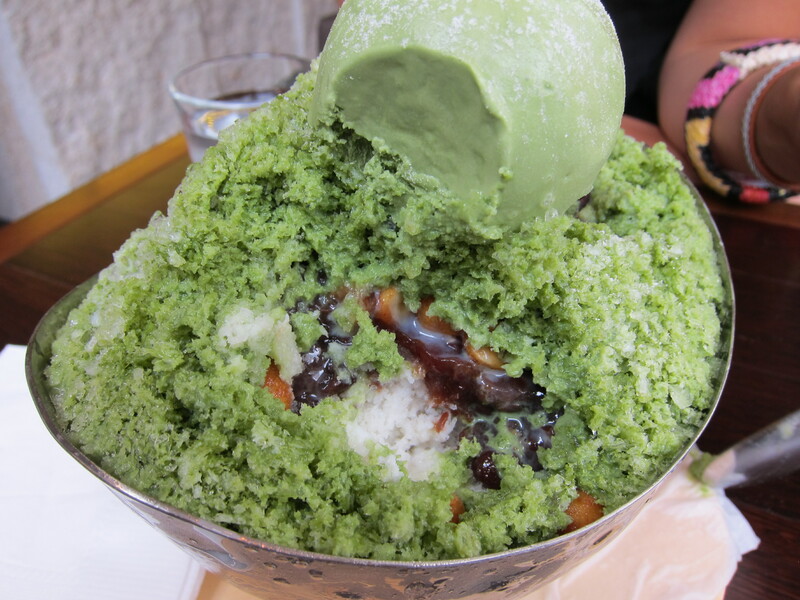 These days, patbingsoo is served everywhere from your hip and expensive Apgujeong cafe to McDonald’s. Starbucks has apparently come out with a red bean frappucino based on the idea and is selling it all over Asia. 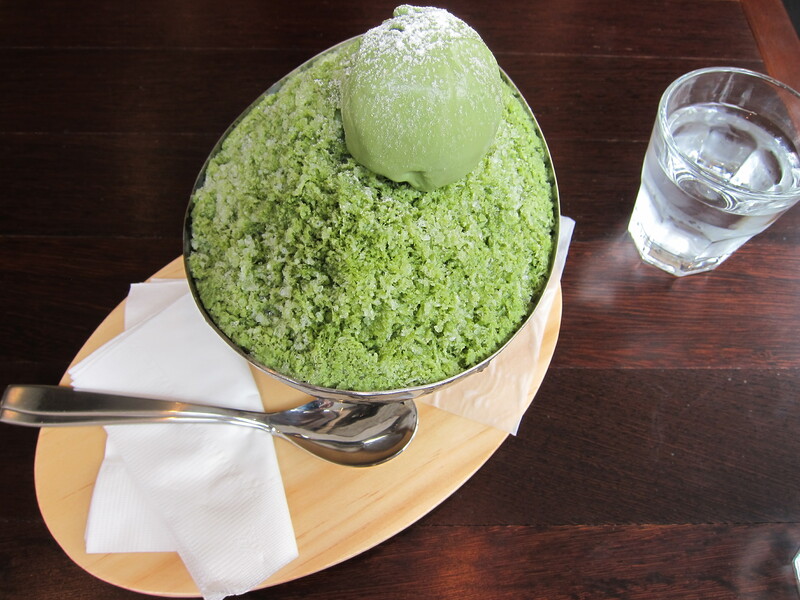 Menus will proudly recite the different versions you can have—green tea, coffee, ice cream, tiny balls of tteok or mochi and more. Ten or so years ago, the fruit on patbingsoo was decidedly canned, little diced cubes of gelatinous sugar. Fresh fruit is now more popular, though it still tends toward the colorful and tropical, like bananas and kiwis. 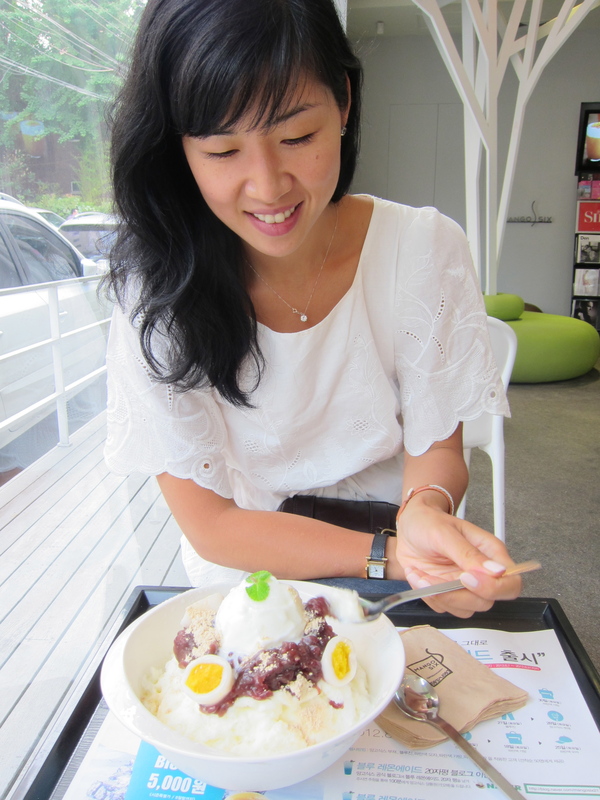 Patbingsoo is such a staple of summer life in Korea, but it’s not something that’s often made at home. My family had a hand-cranked ice shaver when I was young. I think we used it once. Restaurants and cafes will charge you $5, $10, even $15 for something that is essentially ice chips, but all those exorbitant prices come with large, broad glass bowls prettily decorated, as well as multiple spoons. It’s a social dish. You eat it with friends when you’re out. Unless you’re me, languishing in the heat in Brooklyn. Then you order an ice shaver off of Amazon and wait anxiously for it to arrive. The hardest part was choosing the ice shaver. I bought the Hamilton Beach Icy Treats machine at the local Target, but brought it home to find it made chunky ice chips, like the kind you find in Slurpees and crap margaritas. I even went to Assi Plaza in Flushing, but only saw a hand-cranked model and one that looked just like the Icy Treats machine. I am happy to inform you, though, that the Hamilton Beach Snowman Ice Shaver really does make fine, flaky, snowy ice, at least as close as you’ll ever get on a non-commercial machine. And then I got to work making the different ingredients that go into my favorite kind of patbingsoo. I soaked, cooked, and pureed azuki beans. I made up some glutinous rice dough and rolled it into little balls to make the tteok that I love (it’s the same mochi balls they have at Red Mango and Pinkberry). I mixed sweetened condensed milk with whole milk for a smoother consistency, and chopped up the fruit I had in the house, blueberries and nectarines. It took all morning getting everything together, but right around 4 pm, when I could not take the oppressive heat any longer, I assembled my big bowl of patbingsoo, for me and me alone, in just a few minutes. My pat, or sweet bean sauce, wasn’t as slick and sweet as what you find when you’re eating out, and my tteok was a little too hard, not to mention large and ungainly. But it tasted just enough like my memories. I was going to let Ursa, my dog houseguest, lick the bowl, but I couldn’t stop myself. I slurped up the last bits of icy condensed milk. I think she forgives me, though. 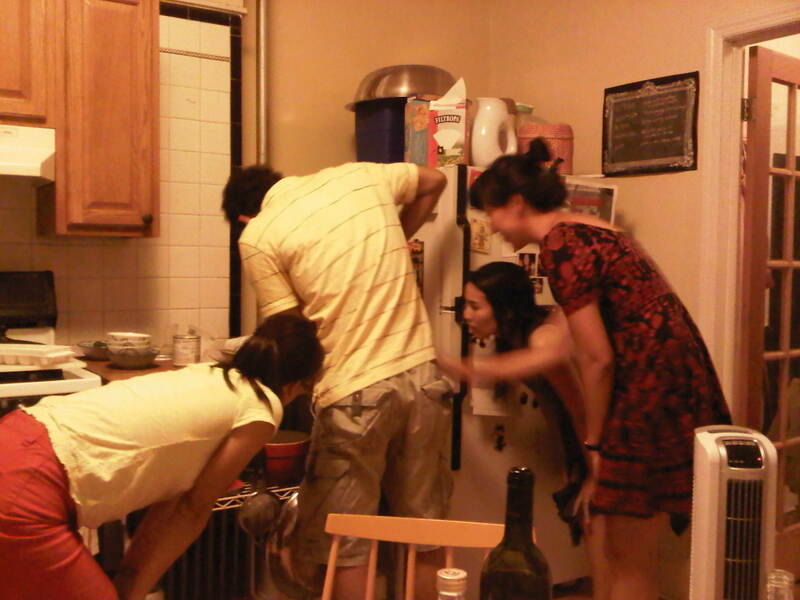 And with a little work, the recipe will definitely end up in the cookbook. There are places in NY where you can find shaved ice. There’s a Korean bakery called Koryodang on 32nd Street that sells it, which I never order because they charge you a lot and the freakin’ thing gets served in a styrofoam bowl with plastic spoons. There’s a Taiwanese shaved ice joint in the Flushing Mall that really does satisfy my patbingsoo cravings, except it’s in Flushing and that’s a two-hour round-trip from my place. A wonderful Hawaiian shaved ice place called Eton opened a year or two ago in Carroll Gardens, and I had one of my happiest solo lunches there ever, two orders of dumplings and tall order of shaved ice with red bean and condensed milk. But it is still worth it to have your very own ice-shaving machine.